The relationship between the Sun and the Earth is at the heart of a complex, dynamic system we do not yet fully understand. At the centre of our solar system is the Sun, a magnetically variable star. This variability has impacts on life and technology that are felt here on Earth and throughout the Solar System. Earth is the only planet we know to be capable of sustaining life. It is our lifeboat in the vast expanse of space. Earth can sustain life thanks to the existence of water, atmosphere and oxygen. This life-sustaining environment came into being 4 billion years ago, and has not changed substantially since then. Unlike Venus and Mars, the Earth has a magnetic field. This field creates a protective shield which stops the solar wind from blowing directly into its atmosphere. High-energy particles such as the radiation belt are produced in the magnetic field. Earth’s magnetosphere is an extension into space of the familiar magnetic field which causes compass needles to point North. Our planet sits at the heart of a magnetic bubble which occupies a volume at least 1000 times greater than Earth itself. 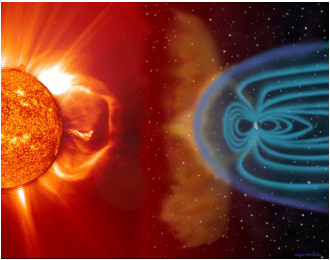 The magnetosphere protects us from solar wind gusts and from potentially deadly solar flares. Without it, Earth might be as barren as Mars or the Moon, two worlds without magnetospheres. The magnetosphere not only shields us from solar radiation but it also acts something like a solar sail. The solar wind pushes on the magnetosphere constantly, but fortunately Earth is just too massive to blow away. Every square metre of the Earth is pierced by a line of magnetic force, which loops from deep inside the Earth and far into space, only to return back in a great closed circuit thousands of kilometres long. If there were no Sun or solar wind, the Earth’s magnetic field would extend far beyond the orbit of the moon and millions of kilometres into interplanetary space. When the solar wind and the magnetosphere are taken together, they operate like a powerful but invisible system. Depending on the magnetization of the particles in the solar wind the field can be southward or northward, attracting or repelling the Earth’s field. The solar wind is composed of charged particles, so it actually draws out the solar magnetic field into interplanetary space and gives rise to a very weak interplanetary magnetic field (IMF) outside the Earth’s magnetosphere. The magnitude of the IMF is 5,000 times smaller than the Earth’s magnetic field at the Earth’s surface. The Earth’s magnetic field has two poles, north and south, but the fields’ pull extends far beyond the surface of the Earth. An average of 50 tons of plasma per day in this field flows against the gravitational pull of the Earth, much as the solar wind flows away from the Sun. This plasma contains hydrogen, helium, oxygen and nitrogen atoms and ions. A magnetosphere has many parts, such as the bow shock, magnetosheath, magnetotail, plasmasheet, lobes, plasmasphere, radiation belts and many electric currents. It is composed of charged particles and magnetic flux. These particles are responsible for many wonderful natural phenomena such as the aurora and natural radio emissions such as lion roars and whistler waves. The particles move and circulate about the magnetosphere and even generate storms. The magnetosphere changes constantly, even flipping its orientation every few thousand years. The most spectacular manifestation of the connection between the Sun and the Earth is the Aurora Borealis (Northern Lights) and the Aurora Australis (Southern Lights). Auroras often accompany magnetic ‘storms’ and an unsettled magnetosphere. They are produced by flows of charged particles from the Sun entering Earth’s atmosphere; they come and go with the sunspot cycle and their colours are the product of excited oxygen and nitrogen atoms about a hundred miles above the surface of the Earth. Auroras are not caused by the direct flow of particles from the Sun into the polar regions, guided by Earth’s magnetic fields. Instead, these currents are generated in the distant, comet-like tail of Earth’s magnetosphere whenever solar activity and severe solar storms are in progress. During a solar storm, some of the energy stored in the tail of the Earth’s magnetic field is transformed into high-speed currents of charged particles. These accelerated particles flow into the equatorial regions of near-Earth space and become trapped as the ring current. Positively charged particles drift westward while negatively charged particles drift eastward. In a process scientists don’t fully understand, some of these particles also flow along the magnetic field into the polar regions. As they enter the upper atmosphere they are accelerated to even higher energies before colliding with atoms of oxygen and nitrogen to produce the aurora’s colours. These million-ampere currents not only cause the spectacular displays we see as auroras, but they also heat the upper atmosphere and ionosphere. Solar storms which fuel auroras can be caused by sunspot clusters. A sunspot is a cooler, darker region on the sun’s surface caused by a concentration of temporarily distorted magnetic fields. Sunspots are capable of spawning tremendous eruptions, or flares, into the Sun’s atmosphere, hurling clouds of electrified gas towards Earth at speeds in excess of a million miles (1.6 million kilometres) per hour.